NASA's Cassini spacecraft captured this image of three Saturn moons (Tethys, at center; Hyperion, at upper left; and Prometheus, at lower left, near the boundary of the F ring) on July 14, 2014. NASA's Cassini spacecraft has snapped a stunning photo of three Saturn moons, showing the satellites in all their disparate glory. The newly released image captures the Saturn moons of Tethys (center), Hyperion (upper left) and Prometheus (lower left), along with the gas giant's iconic rings. While NASA released the photo on Monday (Sept. 22), Cassini actually took the picture on July 14, when it was about 1.2 million miles (1.9 million kilometers) from Tethys. The three moons are vastly different from each other. At 660 miles (1,062 km) wide, spherical Tethys is by far the largest of the three and sports a diversity of landforms on its frigid surface. Hyperion is 174 miles (280 km) across and irregularly shaped; the moon is known for its chaotic rotation and strange, deeply pitted surface, which resembles a sponge. 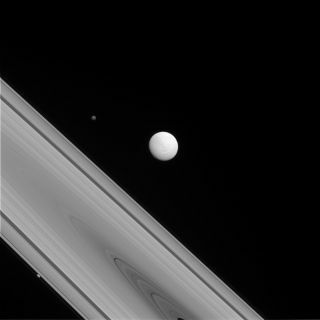 Prometheus is the smallest of the three pictured moons, with a diameter of just 53 miles (86 km). Prometheus orbits near the inner edge of Saturn's F ring, and the satellite's gravity has helped sculpt this structure, creating "streamer" channels and bright clumps within the ring, NASA officials said. The $3.2 billion Cassini mission launched in 1997 and reached the Saturn system in 2004. The probe will continue orbiting Saturn until September 2017, when it dives intentionally into the planet's atmosphere to make sure it doesn't contaminate Titan or Saturn's icy moon Enceladus, both of which may be capable of supporting life.